Review: Ich Hunger / It's Just Movies Review: "Ich Hunger"
Wild Creature meets Tinkerbell in pastoral faux Germany during a murder investigation. Beginning with a deep “Ommmm” beset with cacophonous sounds, “Ich Hunger” delivers an expressionist tableau of foolery and macabre. Experimental camera tricks abound, especially in the creation of Tink, the fairy light Creature chases but can never catch. Amidst cheery background music, Creature cavorts with his prey before his salivary glands motivate him to cannibalism. Tink tells him he’s got a lot going for him, but eating people is a no-no. After having “fun” with a chubby photographer and a boy on a swing, a seemingly unrelated sequence begins with a buxom sweet gal sitting on her bed beside her window. He opens his mouth and we’re not sure at all which appetite he satiates. It’s the classic hypnotizing cobra fable, the forbidden fruit story, the magnetic bad-boy/good-girl syllogism, and the Stalin/Hitler mystique. A sociopath on the loose, Creature has no empathy for his prey. He delights in the chase and his hunger happily motivates his hunt for the next meal. A mutual hunt is instigated by a handsome German police investigator clad in dark glasses. Creature must use his cagey wiles. What do they have in common? What factors distinguish them? And by the way, all is not as it seems – on any level. This seeming German art film, with English subtitles, was created by Isaac Olsen from Tacoma, Washington. It is shot in Flint, Michigan. 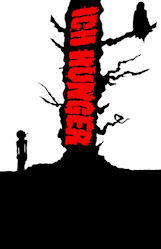 “Ich Hunger” is being screened April 3, 2014, as part of the Northwest Film Center’s Northwest Tracking program, which is dedicated to the work of independent filmmakers in Alaska, British Columbia, Idaho, Montana, Oregon and Washington.